Amazon has reached an agreement with the state of Texas which will allow them to continue doing business there but at a cost -- Amazon will begin collecting sales tax from Texas residents starting July 1, 2012. Texas is the seventh state thus far to make such a requirement. Just last week, Amazon struck a similar deal with Nevada, a deal which is slated to take effect on January 1, 2014. The other five states where Amazon is required to collect sales tax are currently Kansas, Kentucky, New York, North Dakota and Washington. A while back, Amazon shut down its Texas distribution center after the state controller sent the company a bill for $269 million. That intimidating figure, according to the state, was the total amount of sales tax due between 2005 and 2009. After a series of lengthy talks, Amazon reached an agreement where it will be forced to collect sales tax from Texas residents, but manages to avoid paying those $290 million in back-taxes. As part of the deal, Amazon must also create 2,500 jobs within the state, presumably by reopening its fulfillment operations. How has Amazon managed to dodge paying sales tax in so many states for so long? It has been generally accepted that state sales tax is required only of businesses who operate within the state. When it comes to Internet and mail order transactions, purchases are often done across state lines and the actual, physical presence of the company is elsewhere. 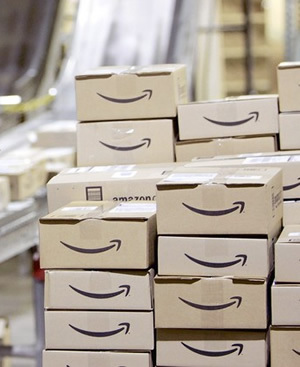 Laws vary from state to state, but federal law does empower states to collect sales tax from Amazon if they have any retail stores or distribution centers within their borders. If Amazon doesn't have a store or warehouse within the state, then Amazon may not be required to collect sales tax. Frustrated with missing out on their cut of Internet sales though, some states like California have already instituted a separate tax to cover Internet transactions. In California, it's called a use tax. Each year (or quarterly), CA residents are expected to report the gross total of their Internet purchases. Those residents then pay the equivalent to sales tax, as if they had purchased them from a CA vendor. Internet purchases which charge the consumer some form of state sales tax are exempt from being reported.